Jose L. Galvan was professor of applied linguistics and held various academic administrative positions from 1976 until his retirement in 2015. Galvan received a B.A. in English, and M.A. in Applied Linguistics, and a PhD. in Psycholinguistics, all at the University of Texas at Austin. He maintains his affiliation with Cal State L.A. as Professor Emeritus. Jose L. Galvan was professor of applied linguistics and held various academic administrative positions from 1976 until his retirement in 2015. Galvan received a B.A. in English, and M.A. in Applied Linguistics, and a PhD. in Psycholinguistics, all at the University of Texas at Austin. He began his teaching career at UCLA, where he also held administrative positions before joining the California State University System at its Los Angeles campus in 1990. He taught and later chaired the TESOL MA Program there until 1998, when he was named Associate Dean of Graduate Studies and Research, and in 2005 he assumed the role of Dean of Graduate Studies and Research. Galvan was then named Dean of the College of Extended Studies and International Programs at Cal State L.A. in 2008 before moving to San Francisco State University in 2011 to become Associate Vice President and Dean of the College of Extended Learning and International Affairs, a position he held until his retirement from academia in 2015. He maintains his affiliation with Cal State L.A. as Professor Emeritus. 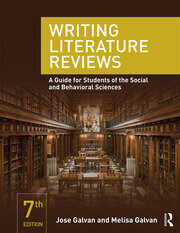 Writing Literature Reviews: A Guide for Students in the Social and Behavioral Sciences was first published in 1998. This textbook is currently used as a required textbook in more than 90 universities throughout the U.S. and was translated to Chinese in 2003. For the 7th Edition of the textbook, Galvan was joined as co-author by his daughter, Melisa C. Galvan, whose significant contributions bring the book in alignment with the modern digital library environment. Galvan was an active Principal Investigator throughout his career, receiving grants and contracts totaling more than $10 million from the U.S. Department of Education, the Fulbright Commission, the U.S. State Department’s Agency for International Development, and several other agencies. And in addition to his university responsibilities, Galvan was active in international work, including teaching assignments in Egypt, Argentina, and China as well as consulting assignments in South Korea and Taiwan. In addition, he traveled professionally to Cuba, Japan, and Vietnam.